Earlier this month, Bishop McDevitt High School earned an “A” in gender policing when school officials demanded that their female students wear dresses to prom. Consequently, when student Aniya Wolf showed up in a tuxedo, she was forbidden entry. 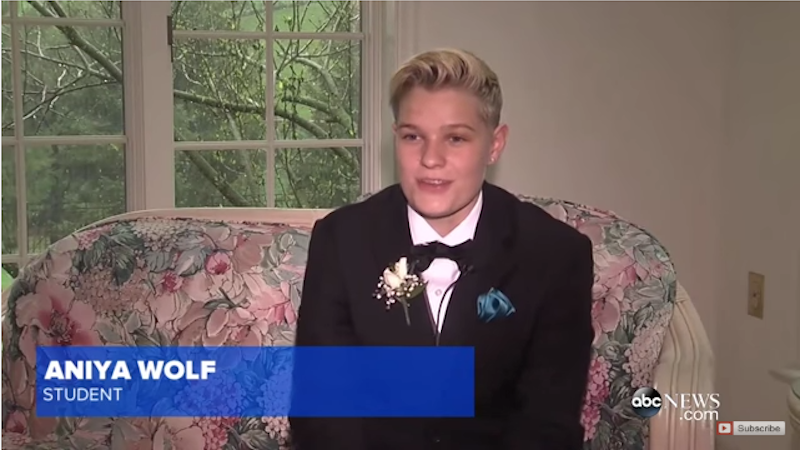 On May 21 she attended another school’s prom instead — and she rocked that suit. “Clarification is key to this story. I am a practicing Catholic, and I live out God’s teachings. I hands down love my teachers, I feel as if they have given me an excellent education, they have never frowned upon the way I present myself. I was presented with not one but two dress codes. The first dress code I was presented with stated that ‘dresses must be formal’ followed by guidelines for a dress but not explicitly stating a dress MUST be worn. This is the dress code my mother and I signed, it stated nothing about women wearing suits NOT to mention females have worn suits in the past according to alumni. No Bishop McDevitt student got an email of the dress code that was ‘supposedly’ sent out on March 9th and March 6th, I asked everyone I know to check their emails, and there was nothing there. The day of prom my mom got a new dress code stating that you need to be wearing a ‘formal dress.’ This dress code was presented to just me. I’m over the situation, but I cannot just sit back and watch this administration completely try to cover up what actually happened. I’m sorry for all those who feel like they have been victims of hatred throughout this incident, but the truth needs to be heard. God doesn’t make mistakes, he makes people out of his image and likeness. But honestly who is Bishop McDevitt to judge? Wolf will also appear on an episode of It’s Always Sunny in Philadelphia. Star and creator Rob McElhenney issued an invitation via Twitter after Wolf’s story made headlines. Top Image via YouTube. Embedded Images via Twitter.